Autumn is coming on strong here in Dublin! The high today was only 12C / 53F! And everyone is catching colds! That’s a sure sign the season is changing. Today I’d like to show you a cute Back to School Look! 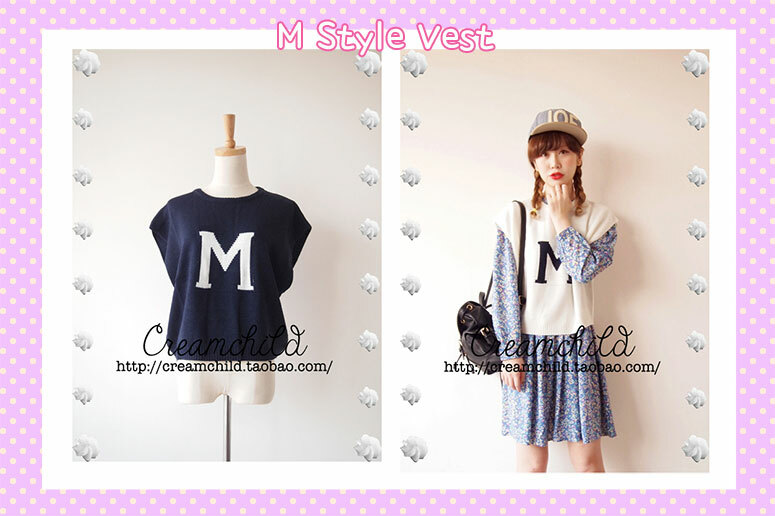 The first part of the outfit is this M vest! I fell in love with it because well, strawberryjam’s real name starts with M! I also like how versatile it is. It can go with a cute, girly vintage outfit. But you can also dress it up a bit sporty like the model above! To finish the outfit and make it more autumn-y, I added this plaid dress. I totally love plaid! It just feels so warming to me somehow.. and school girls wear it too. Don’t we all want to be young? Haha. I selected this dress also because of the peter pan collar! It will peek outside the M vest and look so cute! As for shoes, just add a cute pair of shoes like the cute bow heels! I’d recommend to also add a nice pair of socks like the models did! Peter Pan Collar Dress (Urban Outfitters) $59 – Expensive, but there’s lots of dresses like this all over now! Are you also a fan of this vintage, girly look?